Please click here to see article in The Athens News. The Federal-Hocking Secondary School campus in Stewart soon will start obtaining the majority of its energy needs from newly installed solar panels. According to a post on the School District’s Facebook page, Athens-based Third Sun Solar began the installation process last Monday. “This is the end of six years of work,” Federal-Hocking Supt. George Woods said in a phone interview last Wednesday. The plan to install solar panels began with Woods himself. 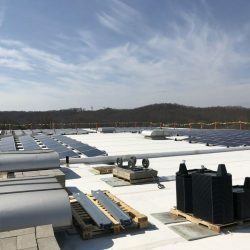 “I was, when I became superintendent, looking for opportunities to both cut costs and put us on the cutting edge of things that are going on,” Woods said, adding that he “always envied the solar array at the Athens County Community Center” and wondered if a similar array could be set up for Federal-Hocking. After talking to engineers and others in the solar industry, Woods said he decided that the best option for the district would be to try to install solar panels on the rooftop of the school building, rather than creating a standalone structure like the one at the Community Center. He reached out to Third Sun Solar, and the planning and engineering work began. Third Sun Solar founder and CEO Geoff Greenfield is also founder and co-owner of NRS, he confirmed in an email last Friday. He founded the company, then called “Newtility Energy,” seven years ago as a way “to fund, own and operate clean-energy projects and sell the electricity to the building owners,” Greenfield said in the email. “We did the solar on the Athens County Public Library this way and own a couple other projects,” he said, adding that the company two years ago gained more partners and investors, and then changed its name. Federal-Hocking’s “solar power plant,” as Woods has called it, is a 700-kilowatt solar-power installation that will generate 76 percent of the power for its middle- and high-school campus, according to the Third Sun representative. The power generated would only be used for the high school and middle school campus, not the entire School District (which also includes Coolville and Amesville elementary schools), Woods said. The installation will take about 12 weeks to complete, and panels will cover the entire roof of the high-school and middle-school building, including the gyms, Woods said. Foundation Renewable Energy Company contributed $1.6 million to the project, Woods said, while the district contributed $400,000 of capital-improvement funds. In eight years, according to Woods’ email, the School District will “have the option to purchase the plant for current market value and then get the power for free. We cannot say what the current market value will be, as that is not established, of course, but given that the plant will be eight years old and very expensive to remove, the value to an outside company will be very low. The funds used to co-fund the project were set aside by the School Board specifically for that purpose, Woods said. “They’re not funds that we could have used for salaries or books or anything like that; it’s funds that the district set aside for capital improvements and physical improvements. Woods said the solar installation also has educational and economic benefits for the district and the community.